This book is intended to assist scientists in planning and carrying out research. However, unlike most books dealing with the scientific method, which stress its philosophical rationale, this book is written from a practical standpoint. It contains a rich legacy of principles, maxims, procedures and general techniques that have been found useful in a wide range of sciences. While much of the material is accessible to a college senior, the book is more specifically intended for students beginning research and for those more experienced research workers who wish an introduction to various topics not included in their training. Mathematical treatments have been kept as elementary as possible to make the book accessible to a broad range of scientists. Its principles and rules can be absorbed to advantage by workers in such diverse fields as agriculture, industrial and military research, biology and medicine as well as in the physical sciences. 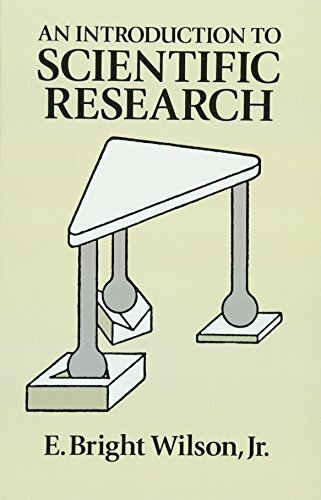 After discussing such basics as the choice and statement of a research problem and elementary scientific method, Professor Wilson offers lucid and helpful discussions of the design of experiments and apparatus, execution of experiments, analysis of experimental data, errors of measurement, numerical computation and other topics. A final chapter treats the publication of research results. Although no book can substitute for actual scientific work, this highly pragmatic compendium contains much knowledge gained the hard way through years of actual practice. Moreover, the author has illustrated the ideas discussed with as many actual examples as possible. In addition, he has included notes and references at the end of each chapter to enable readers to investigate particular topics more deeply. E. Bright Wilson, Jr. is a distinguished scientist and educator whose previous works include Molecular Vibrations and Introduction to Quantum Mechanics (with Linus Pauling). In the present book, he has distilled years of experiment and experience into an indispensable broad-based guide for any scientific worker tackling a research problem.